Not too long ago, Art did an article on the hardest languages to learn. This interested me a lot because I’ve been interested in languages for quite some time. Ever since I was a boy, I was interested in how other languages had similarities with ones I already knew and was quite pleased to find out this was due to similar histories. When I started traveling, this passion increased further. 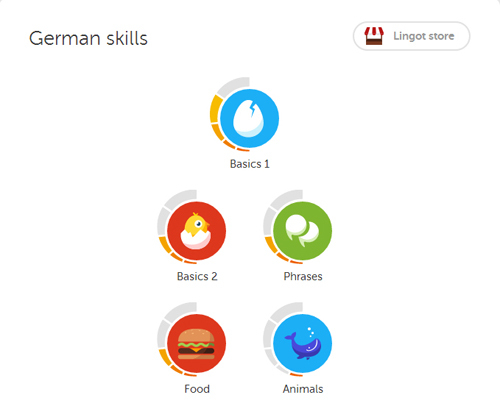 Today, I’m going to do a review on one of my most used apps when it comes to learning languages: Duolingo. I believe that learning languages can boost your business because a lot of people out there haven’t learned English and miscommunication can lead to missed opportunities. A lot of people don’t have time for a personal tutor and even though no app can replace the real thing, Duolingo seems to be the one that works the most for me. 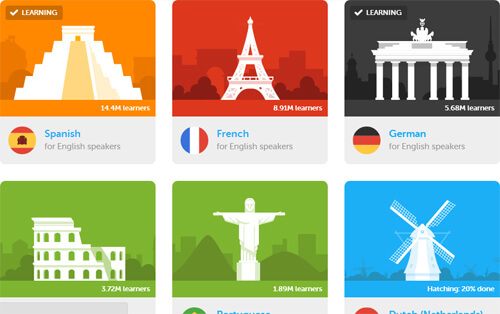 Starting out as a way to translate websites, Duolingo evolved into a language learning app for both the computer and the mobile device that teaches Portuguese, Spanish, Italian, French, and German. Other languages are currently in development, and of course, there are also options for native speakers of non-English languages to learn as well, such as French to German. 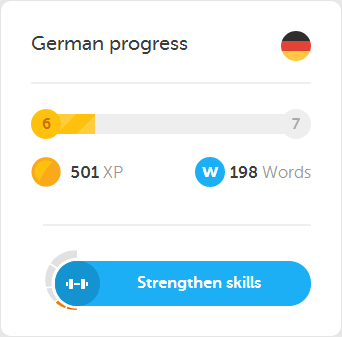 I learned about this app a few years ago when I was out of money, but wanted to learn German. The Berlitz book was extremely detailed, but reading a book with nobody to practice with was quite boring for me. It was a simple Google search: “Language Learning Apps Online.” I found a ton of them and reviews. Beside Duolingo was Italki, Busuu, Livemocha, etc. I tried a lot of them, but Duolingo caught me with its colorful website design and unique social aspect. When I opened Duolingo, I was a bit sad that the languages were quite limited. It didn’t have any of the Asian languages, such as Japanese, Mandarin, Arabic, or Korean. Norwegian and Dutch were missing too. I found out they were in development by the community, but up to this point, they haven’t been published. 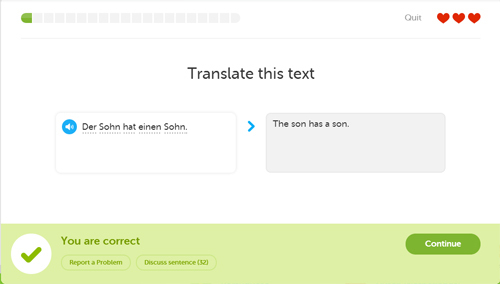 But I came for German, so I selected it. As soon as I selected a language, I was greeted with a simple and easy-to-learn interface and notable features you won’t find in other apps. There were cheeky and colorful icons to represent each lesson, progress bars, and a ranking system with your Facebook contacts. I’ll go over those first, before the actual lessons. Duolingo fixes that by telling you who of your contacts are learning a language now, have learned a language before, and which languages those are. But it doesn’t show you the actual lessons. It also grades everyone by experience points and levels, and shows who’s more advanced through a leaderboard, which has tabs of All Time, This Week, and This Month. Duolingo is as much an MMOG (massively multiplayer online game) as it is a language learning app, using a sense of competition to your advantage. On top of the leaderboards is your own personal progress, which shows you how many words you have learned from your current language. It also tells you how much experience points you need until you reach the next level, possibly toppling the score of your friend. This section also has a button “Strengthen Skills” which allows you to go back to previous topics you haven’t touched for a while. Obviously I need to update my German. Beside both the leaderboards and the progress chart is the main section with all of the lessons. This is where Duolingo shines in my opinion. You’ll notice that unlike other apps, Duolingo is not linear at all. Even though your first lesson is Basics 1 (as it should be), this splits into Basics 2 and Phrases, allowing you to pick either. As you finish each row, you are given a choice of two to three more lessons which can be chosen in any order so you can learn what you want to learn. After every few lessons, a checkpoint is met where in you must take a test regarding all previous lessons so you can proceed. Think of it as a skill tree in a game like World of Warcraft or Guild Wars. The gaming aspect is expanded in the actual lessons, where you are given 10 or more questions per topic. You are given four “lives” denoted by heart symbols, which is the number of mistakes you can make before needing to repeat it. The lessons also give you a variety of multiple choice, recitation, and fill-in-the-blanks, all with versions of to-English and from-English. New words are outlined and hovering over them will give you the translation for free. And sometimes you will get notes on grammatical rules that don’t exist in English. 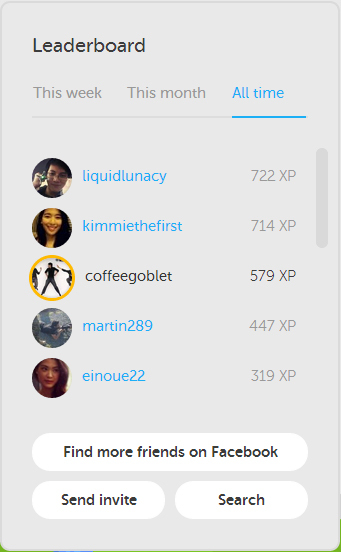 As you start learning, you’ll also notice a stream of updates on who learned what and when they leveled up. Sort of like an automatic Twitter feed. A lot of people don’t care about this, but to me, seeing that others are in it as well gives me motivation. I’m the type of person who likes excelling over others especially when we’ve started the same time. On the right side of the top bar, you’ll notice announcements, lingots, and streak. Announcements are just your news on updates. Streak is your number of consecutive days learning (at least one lesson a day), and lingots are Duolingo’s form of currency. 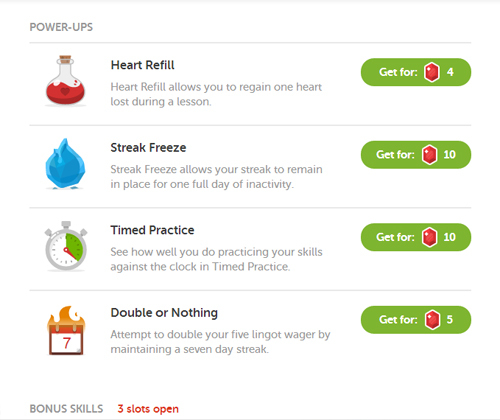 With lingots, you can buy health potions to refill your lives on the fly, a streak freeze to maintain your streak as you go on vacation without internet or a busy period at work, timed practice, a double-or-nothing wager for a 7 day streak, and bonus lessons such as figures of speech, small talk, and flirts. Lingots can be acquired by doing almost anything: leveling up, finishing a skill, inviting friends, gaining streak, and more. On the left side of the bar is your usual menu. Here, you find the home page, the activity feed, and two interesting concepts: discussion and immersion. Discussion is where you can talk to other learners or native speakers on everyday topics, like a multi-lingual chat room, and immersion is where you can translate the internet, including Wikipedia pages. If accepted, your translations will be published on the pages themselves and you will be a contributor to making the World Wide Web a bit more worldwide. It’s Free. I tend to be a cheapskate sometimes and will always look for the best ratio of price-to-quality. Costing nothing, I have nothing to lose with Duolingo. All they ask for (and this is never forced on you) is that you pay back in the future by helping translate the web. The learning curve is not too steep. Over the weeks of learning, you’ll notice that your lessons slowly progress. At the beginning, you learn things like “boy” and “apple,” but after a while, you see yourself progressing to verb tenses and unique grammatical rules. With some holes, I don’t see much difficulty in learning with Duolingo, unless you try to learn 100 words a day, which you’re obviously not supposed to do. It motivates you. From the fear of losing your streak, to that of a friend overtaking you, to the regularity of the activity feed, there is no lack of competition. You can also set it to mail you at certain times of the day if you haven’t studied yet and will also message you if you seem to have forgotten about your lessons. Lastly, it’s a game. I love games. I remember that as a child, my mom would help me get my grades up by giving our tutorials a Jeopardy format. And as an introvert, the only way people to get me to hang out with them is if they had a gaming console I didn’t have. I soon grew up to love MMORPGs such as Ragnarok and Guild Wars. Duolingo shouts out to that aspect of me by letting me gain experience points and currency with which I can buy potions through a skill tree which I choose on my own. Through our need of competition, my friends and I remind each other to get back on as soon as we notice each other’s weekly experience to be at zero. 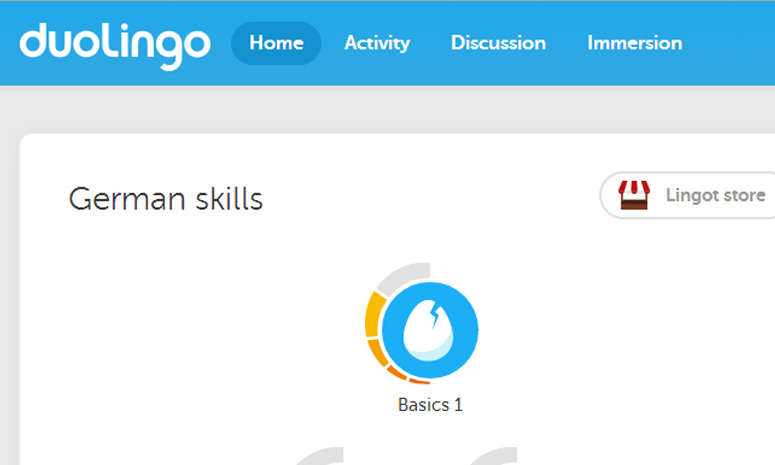 And that’s about it: my review on why Duolingo is the best online app for learning languages by yourself. If you want to tap into large markets such as Mexico or Brazil, you’ve got Spanish and Portuguese lessons waiting for you. Comment below if you’ve got anything to add. Have you tried Duolingo or any other similar apps? Which one do you like the best? And do you thank any of these for increasing your profit?